So many conversations I have with friends, family and colleagues center on this idea of colliding personal and professional passions, being more intentional about working with purpose and trying to find more joy in every moment. Across sectors, employees increasingly want to know and feel that the time and skills they put into their jobs are making a tangible, positive difference in the world. This is a common sentiment, especially prevalent among millennials, who are often more likely to seek out positions with organizations that offer and support active community engagement and skill-based volunteer opportunities. Proof in the pudding: 84 percent of millennials made a charitable donation in 2014 and 70 percent volunteered in some capacity, but only about half reported that they did so through their employers. Seventy percent say a company's commitment to corporate social responsibility (CSR) would influence their decision to work there, according to Douglas Marshall, Managing Director of Corporate Citizenship for Deloitte. As employees continue to show interest in community and volunteer engagement, and their organization's contribution to the global community, leaders are responding with more coordinated and coherent strategies and programs that support philanthropy and purposeful business activities. Fortune 500 firms currently spend more than $15 billion a year on CSR activities. That number is rising as businesses see signs that investments in CSR improve company performance, talent recruitment and retention. Giving in Numbers, a study published by the CECP that analyzes giving and corporate societal engagement trends, revealed companies that increased giving by at least 10 percent between 2013 and 2015 actually experienced upticks in revenue and pre-tax profit, while all other companies saw a decrease in both. Those organizations seeing the greatest success are making deeper and longer-term commitments that align with the values of their employees, their customers and the communities they serve. Stand-out trends include advocacy on social issues, an increase of resource allotment for community volunteerism and a focus on long-term social value versus meeting short-term profit goals. "A genuine leader is not a searcher for consensus but a molder of consensus." - Martin Luther King Jr. In the past, corporate leaders have shied away from taking a stand on controversial issues for fear of alienating large groups of potential constituents. However, as social media magnifies calls for change from both employees and consumers, CSR-minded corporations are increasing their support for causes, not only with dollars, but also by using their brands and voices to raise awareness of issues that affect our communities. "We're definitely seeing an evolution of the corporate statesman," said Barb Short, Managing Director of Corporate Leadership at CECP. "Bob Forrester of Newman's Own Foundation has often said that Paul Newman, one of CECP's key founders, would be gratified to see the progress in how today's most respected companies and CEOs are using their resources and influence to ensure that business plays a role in solving our most challenging social problems." For example, Adam Silver, Commissioner of the National Basketball Association, pulled the league's All-Star Game out of Charlotte, N.C. in response to protests over HB2, a state law seen by many as discriminatory against the LGBT community. The league's decision will have an estimated $100 million impact on the Charlotte Hornets franchise and local businesses. "It is always important to us to provide the best experience possible to our fans at all of our events," said Mike Bass, the NBA's Executive Vice President of Communications. "In order to successfully host a marquee event like the All-Star Game, we need to be able to provide an environment where all of our fans, players, business partners, league and team officials can feel welcome, and the current environment in North Carolina created by HB2 precluded us from doing that." While we often hear about professional athletes generously giving back on an individual basis, the NBA as an institution has been a progressive leader among major sports leagues in using its resources to reach out and support disadvantaged communities. "Our league and players have a long history of standing up for the principles of fairness, respect, diversity and inclusion," Bass said. "Through our NBA Cares platform, we aim to partner with organizations that embody these principles while also helping to create meaningful change all over the world. Examples include our partnership with LeanInTogether, which supports women and men standing up for equality; our commitment to My Brother's Keeper to recruit more than 25,000 adult mentors of color; and our relationship with Special Olympics, which connects our athletes to Special Olympics athletes around the world to provide opportunities to develop physical fitness and demonstrate courage and empowerment." 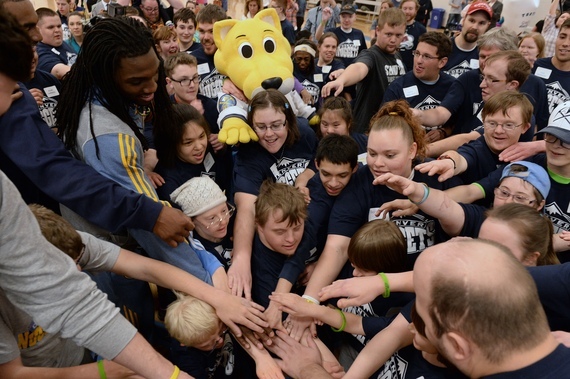 Kenneth Faried of the Denver Nuggets with Special Olympics athletes. Credit: NBAE Photos. While organizational performance is multi-level and multi-dimensional, there is an undeniable link between the performance of organizational leadership and the overall performance of the entire organization. More leaders are acknowledging the very real correlation between health and happiness, and happiness and productivity (recent research shows that happy workers are 12 percent more productive). Therefore, more executives have increased attention on internal workplace issues such as employee health and wellness. One example is Aetna's CEO Mark Bertolini, who in the last two years, has raised the minimum wage for his employees to $16 an hour and launched a program to lower the out-of-pocket medical expenses for thousands of Aetna's lower-paid employees. Beginning in 2017, the company will start matching employees' student loan payments up to $2,000 annually with a lifetime maximum of up to $10,000 for qualifying loans. These are generous and innovative financial packages, but as Bertolini wrote in his Huffington Post column, companies need to go "beyond the paycheck" when looking at employee wellness. "The wellness programs that are most effective are simple, engaging, based on people's personal values, goal-oriented and fit into people's daily lives," Bertolini wrote. Aetna's initiatives combine the latest scientific research with access to a broad network of resources and healthcare professionals. Employees benefit from this holistic approach to wellness that boosts energy, creativity and productivity levels, and also addresses so many of people's health needs - such as physical fitness, sleep habits, disease prevention and stress management. According to Aetna's research, the 13,000 employees who participated in one of their mindfulness-based wellness programs from 2012-2014 regained 62 minutes per week of productivity with an approximate dollar return, in terms of productivity alone, of more than $3,000. Aetna and Bertolini have received numerous awards for the company's health and wellness programs, and Aetna is annually listed as one of the best corporate workplaces in the country. According to the Imperative Workforce Index, employees who work for purpose-oriented companies experience a 20 percent longer tenure, 50 percent greater likelihood to hold a leadership position and 47 percent greater likelihood to serve as company advocates. For that reason, it's more important than ever to connect people with purpose in the workplace. "Interest continues to grow in work that elicits passion and allows individuals to pursue professional, personal and social goals simultaneously - and they are seeking employers with similar values that create opportunities for employees to pursue purpose in their daily work and through company initiatives," said Douglas Marshall, Managing Director of Corporate Citizenship at Deloitte. CECP says employee satisfaction rates continue to increase when employees are offered skills-based volunteer programs. For many employees, this is a critical way for them to find meaning in their work outside the office. CECP reported that companies who offered skills-based volunteer programs through pro bono service and board leadership had the highest participation rates among employees this past year. In an examination of 69 companies from 2013 to 2015, volunteer participation rates increased from 28 to 33 percent. Large economic institutions such as Deloitte and Bank of America are growing their skills-based volunteering programs so that employees can take their abilities beyond the workplace to explore their passions and provide meaningful service to nonprofits. Ninety-three percent of Deloitte employees said their participation in pro bono work made a positive impact on their job satisfaction, while 84 percent reported significant gains in job-related skills. These programs allow nonprofits to learn from experts in their fields who provide financial consulting, membership on boards and committees and development of technology solutions. "We work hard to ensure that our volunteer program offers employees an opportunity to connect in a meaningful way with nonprofits serving community needs," said Kerry Sullivan, president of the Bank of America Charitable Foundation. "From building leadership skills to gaining a better understanding of community challenges, we believe our employees develop and grow through volunteer efforts while also helping to build thriving communities in which to live and do business. Skills-based volunteering, such as board service, advancing better money habits or providing technology assistance to nonprofits, has been a great avenue for employees who wish to leverage their expertise to further the critical work of our nonprofit partners." With a lens toward sustainability, business leaders are thinking long-term and demanding a new standard of management that prizes constructive stakeholder engagement. Over the summer, Warren Buffett, Larry Fink, Bill McNabb and some of the other biggest institutional investors in the world released a letter called The Commonsense Corporate Governance Principles. In the letter, the investors state, "We share the view that constructive dialogue requires finding common ground -- a starting point to foster the economic growth that benefits shareholders, employees and the economy as a whole." They also suggest that "our financial markets have become too obsessed with quarterly earnings forecasts." They recommend that boards and executives of Fortune 500 companies focus on long-term CSR strategies like increasing diversity at the C level and improving transparency with shareholders and the public. To build solid foundations for their CSR efforts, many companies are linking purposeful activities to their own core competencies, allowing them to highlight the impact they are making on society while showcasing the value of their expertise in the real world. 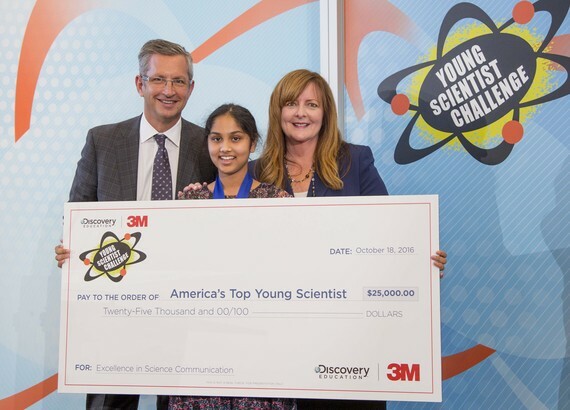 For example, global manufacturer 3M partnered with Discovery Education to create the Young Scientist Challenge, a mentorship program that identifies talented young minds and gives them the opportunity to work with professional scientists to brainstorm innovative, real-world solutions to significant societal challenges. Jon Lindekugel (left), Senior Vice President, 3M Business Development and Marketing-Sales, and Lori McFarling (right), Senior Vice-President & Chief Marketing Officer at Discovery Education, present a $25,000 check to 13-year-old Maanasa Mendu (middle) from Mason, OH, the winner of the 2016 Discovery Education 3M Young Scientist Challenge. Credit: Discovery Education. "We know firsthand the importance of inspiring the next generation of scientists and inventors," said Michele Whyle, 3M Brand Director, Global Marketing Excellence. "We work with schools to strengthen their STEM curriculum, send 'Visiting Wizards' into classrooms to perform experiments and welcome high school students into our laboratories for summer employment...It's a highly successful platform for us to showcase the brand in an authentic way that speaks to who we are and what we care about." Projects like the Young Scientist Challenge are part of a growing emphasis by businesses on education, particularly STEM subjects (science, technology, engineering and mathematics), the CECP report revealed. Corporate leaders hope their investments in public health, financial literacy and education will pay off down the road by creating a future labor force fluent in STEM concepts. This will make their future workers capable of pioneering new solutions that create a better society as well as advance their business interests. "It's tremendously gratifying to see organizations like 3M and others applying their expertise to support teaching and learning in their communities," said Lori McFarling, Senior Vice-President & Chief Marketing Officer at Discovery Education. "We're seeing more and more companies incorporating education into their corporate mission and making it a meaningful part of their brand profile. This authentic commitment to impacting young people strengthens communities and improves student access to meaningful opportunities for learning that were previously unavailable." Millennials' commitment to meaningful social impact will play a tremendous role in shaping the future of CSR. For the new generation of workers and consumers, wearing a white hat means more than just making a transactional donation. Investing in CSR has become part of the price of doing business. A recent trend Douglas Marshall from Deloitte said he has seen more of is the mentorship of younger millennials by older millennials and the idea of intrapreneurship. "Intrapreneurship is all about hacking the system, building from existing skills and frameworks, and finding agency and opportunity that are extensions of centrally organized efforts," Marshall said. "This is exciting, and we are actively thinking about how to be responsive to this energy, try new things and look to scale what works. We are committed to continual improvement, which involves assessing what's working and opportunities to enhance, listening to our people, innovating, piloting and evolving." In its report, CECP predicts that companies will consider corporate citizenship qualities such as integrity, altruism and collaboration as they hire and develop leaders at all levels to drive their business growth, weaving CSR into the fabric of their organizations. Fortune 500 companies have a powerful voice in our society and when they use their platform to tackle social issues, they improve their own organizational health, as well as advance the health of communities and society at large. By improving organizational performance, job satisfaction and striving to make the happiness and health of their employees a priority, so many of these organizations mentioned are providing inspiration across sectors of passionate leadership that understands and values today's interconnected society, and how business with a purpose creates both a dynamic culture while making a difference in this world for the better.